Louise Beavers is one of my favorite African American figures from classic Hollywood, because her real life so thoroughly contradicts her screen image. In nearly all of her films she was a domestic—usually a maid, sometimes a cook. She was jolly, open-hearted, laidback and plump. Off screen, Beavers was a sophisticated matron of Hollywood’s black community. She dressed the part of a star, wearing furs, jewels and fancy hats. Far from being laidback—Beavers was a savvy career woman who survived for decades in a brutal industry. She was also friendly to her fellow actors, even temporarily housing newcomers such as Fredi Washington, but it is said that she was always a bit self-protective and emotionally removed. Though Beavers was a bit plump, she had to force-feed herself to attain the mammy-type weight the studio desired. Perhaps most amusingly of all, Beavers hated to cook. Fortunately, she made enough money that she only had to step in a kitchen while she was on camera. Her big role was as the maid-turned-pancake queen Delilah in Imitation of Life (1934). She plays a single mother who combines resources with a white woman named Bea (Claudette Colbert) in the same situation. They struggle to survive, until Bea decides to box Delilah’s delicious pancake flour. They make a fortune, but continue to struggle with their personal lives. In this expertly-crafted melodrama, Beavers constantly gets patronized, loses her light-skinned daughter when she decides to live as a white woman, lives in the basement of mansion essentially paid for with her pancake flour and is offered a mere 20% of the profits on a business that could not even exist without her contribution (she begs her white partner to keep the cash and let her continue to live in the basement). Though she is the character most in need of a foot rub, she seems to always be giving them to Bea. And yet, Delilah is the emotional center of the movie. Her dilemma is the most compelling element of the plot, which she drives, from her alliance with Bea to the success of her flour recipe. She is buoyed by her faith, and though her daughter’s desertion breaks her heart, she is not bitter, but rather full of love for her baby girl. This was also the first time an African American woman’s troubles had received significant attention in a mainstream movie, and Beavers made the most of her pioneering role. The press tended to agree that she had stolen the movie from her white costars. Unfortunately, Beavers’ enormous success in Imitation of Life did not lead to more juicy roles. In fact, it even hurt her career, because her agents made such inflated salary demands that she was priced out of the roles available to her. Still, she always managed to find work—and her career would last into the sixties. Though Imitation of Life is Beavers’ most celebrated role, I tend to prefer the moments she shined in her supporting roles. She always added an extra bit of life, warmth and wit to her lines. 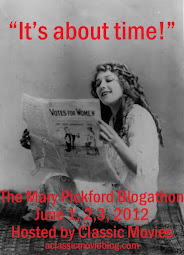 This woman was subversive, though you’d never know it from that beaming smile. I tend to view Beavers as the strongest element of this melodrama starring Jimmy Stewart and Carole Lombard. As their supportive maid, she is always the character most able to step back and view things philosophically. 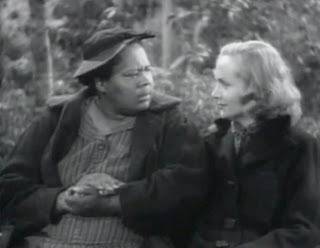 Beavers is a lively, warm presence throughout, but she is most compelling in a scene with Lombard on a park bench (pictured above), where she imparts her wisdom with gentle good humor. This is my favorite Beavers character, though her screen time is frustratingly brief. She is the former maid of club owner and numbers runner Joan Blondell, now running the numbers business for her in Harlem. Though she claims to want to go back to serving Blondell, it’s hard to believe she really means it. After all, this is the most glamorous and brilliant Beavers ever was on the screen. With her furs and jewelry, she could have stepped out of a photo of the real Beavers doing the town in Hollywood. She is also given a more intelligent character, one who sits beside Blondell as a business partner. Seeing her this glamorous makes me wish she could have filmed a biopic of hair preparation queen Madame C.J. Walker . Nice post. Louise Beavers deserved better, so did others. Thanks for reminding us of her other work by including those descriptions of some of her other roles. I liked her subversiveness. Thanks Jacqueline! I think more people are fans of Beavers than they realize. It certainly took me a while to realize I perked up everytime she came on the screen.